Polling data in three swing states have Democratic presidential candidate Hillary Clinton in narrow or losing positions against Republican presidential candidate Marco Rubio, according to latinpost.com. The Quinnipiac poll was conducted between June 4 and June 15 with 1,147 Floridian, 1,191 Ohioan and 970 Pennsylvanian voters. In the Sunshine State, former Secretary of State Clinton did manage to receive more support than Rubio. The Quinnipiac report found Clinton receiving 47 percent to Rubio’s 44 percent. However, In the polling against Clinton, Rubio gave the narrowest margin of victory to Clinton among the GOP presidential candidates. Former Florida Gov. Jeb Bush also lost against Clinton in Florida. While she received 46 percent, he attracted 42 percent of the vote. Clinton also beat the rest of the GOP field. In a match against Sen. Ted Cruz of Texas, she wins 48 percent to 37 percent, respectively. She also defeats Sen. Rand Paul of Kentucky 46 percent to 39 percent, and Wisconsin Gov. Scott Walker 48 percent to 38 percent. In Ohio, Clinton tied against Senator Rand Paul at 43 percent each, and actually lost against John Kasich in a hypothetical matchup, 40 percent to 47 percent. In Ohio, Clinton defeated Rubio with 45 percent to 42 percent. Rubio managed to defeat Clinton in Pennsylvania in the polling. The Florida senator received 44 percent to her 43 percent. She also loses in a matchup against Paul, 45 percent to 44 percent. Clinton beat the other Republican contenders in Pennsylvania. USA Today: Should Hillary Pay Interns? Carolyn Osorio recently wrote an op-ed for the USA Today about her unpaid internship with the campaign of Hillary Clinton. Osorio believed that the “fellow” position would be paid. Below are some excerpts. Will these two be the candidates in 2016? MSNBC’s Rachel Maddow looks at Jeb Bush and Hillary Clinton and their names. South Carolina Republican Senator Lindsey Graham received a call from a fellow presidential candidate on Saturday afternoon: that of Hillary Clinton. 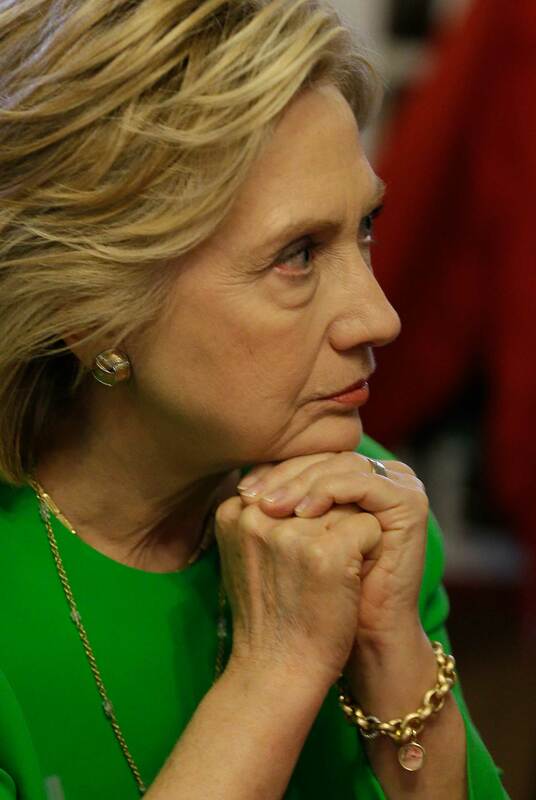 The Democratic presidential candidate (Clinton) told the Republican presidential candidate that she was reaching out to give her condolences in regards to the tragedy in his home state. “She said she was calling to see how I was doing, and wanted to let me know that she was thinking about me and about everyone in South Carolina,” Graham said to CNN. He said he was “pleasantly surprised” to get the call – mostly because he knows that she is a busy person. “I know firsthand how hard it is to run for president,” Graham said. Recently, Secular Talk took a look at an article about Hillary Clinton’s ties to Wall Street and the financial industry. Senator Bernie Sanders touches on the big topics on CBS’ Face The Nation with host John Dickerson. Sanders is a presidential candidate on the Democratic ticket. Here, he mentions the likelihood of jobs being moved overseas and the secrecy of the TPP trade agreement as reasons for not supporting the deal. He also looks as some of the differences between himself and Hillary Clinton, the Koch brothers, the Keystone XL pipeline, and other topics. USA Today writes that Hillary Clinton told Iowans Sunday that the President should listen to concerns – including those of fellow Democrats – about a huge trade deal he is trying to push through Congress. Hillary Clinton said the point should be “to make sure we get the best, strongest deal possible,” wrote USA Today. “And if we don’t get it, there should be no deal,” she said. Critics, including rivals from Clinton’s left, have said she needs to take more of a stand on the huge trade deal, which is still being negotiated with other countries, according to USA Today. Union leaders and many Democratic politicians fear the deal would lead to losses of U.S. jobs to overseas competitors. Articles claim that anywhere from 700,000 to 5 million U.S. jobs were lost due to the NAFTA trade deal. Her stance on the Trans Pacific Partnership drew raucous applause from several hundred people gathered at the Iowa State Fairgrounds for the first public rally in Iowa of Clinton’s 2016 presidential campaign. She noted that the final Trans Pacific proposal has not been released. FreespeechTV claims that the information we do have about the TPP comes from groups like WikiLeaks. The New York Times did an article on the TPP in conjunction with WikiLeaks.